Hurricane Bill’s storm surge struck with fierce and terrifying power Sunday on the shore of Mount Desert Island when the raging water lashed up and crashed on sightseers near Thunder Hole, sweeping three out into the turbulent sea. One of the three, a 7-year-old girl, later died. The girl, her father and a 12-year-old girl were all plucked from the water by rescuers. The man and his daughter are from New York City, Acadia National Park Chief Ranger Stuart West said. The other girl is from Belfast and is not related to them, West said. He would not release their names. The man and the 12-year-old girl were rescued by the Coast Guard about 45 minutes after the waves swept them into the ocean around midday and were hospitalized, according to Chris Berry, civilian search and rescue coordinator for the Coast Guard. The man is believed to have a heart condition, and the 12-year-old girl suffered a fractured leg, he said. The 7-year-old girl was found hours later unresponsive in the ocean and taken to a hospital, Berry said Sunday evening. Would you visit Thunder Hole when storm conditions exist? 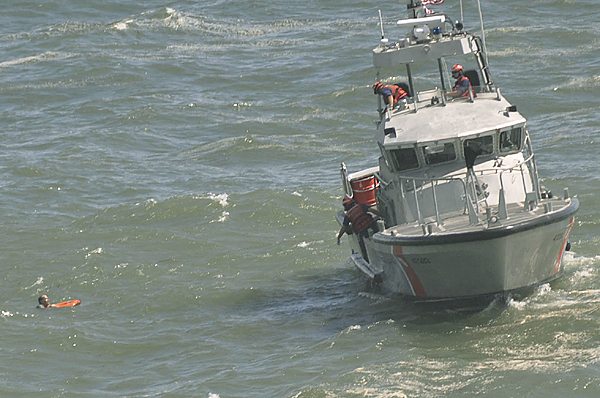 The waves swept over 20 people, Coast Guard Petty Officer 2nd Class Adam Sansoucie said. West said 11 people were taken to the hospital, mainly for broken bones after being slammed onto the rocks. West said people occasionally slip on the park’s rocks into the ocean, but it’s unusual for them to be swept away by waves. James Kaiser of Bar Harbor was taking photographs when he heard shouts that people had been swept into the 55-degree water at the park’s Thunder Hole, a popular tourist attraction where waves often crash into a crevasse and make a thundering sound while splashing high in the air. “I could see two people’s heads bobbing in the water,” Kaiser said. He said he thought they would be bounced back to shore because the waves were coming in so hard but instead the current took them away from shore. Kaiser said many people didn’t even move when they were splashed by the waves and instead seemed to laugh it off. Park rangers received initial reports that as many as five people had been sucked into the water, park Ranger Sonya Berger said, but by Sunday evening no one else appeared to be missing or unaccounted for. 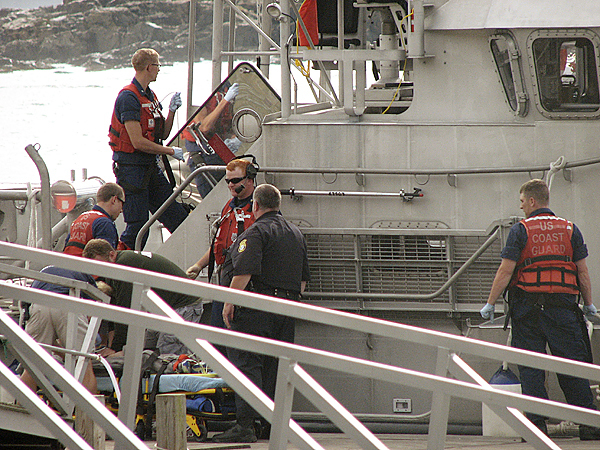 Berry said that the Coast Guard believed two additional people were pulled into the water but were immediately rescued by other people who were nearby on the rocky ledges. Berry said that the waves along Ocean Drive, where Thunder Hole is located between Sand Beach and Otter Cliffs, were estimated to be 17 feet high. During the search Sunday afternoon, spray from waves crashing at Otter Cliffs could be seen shooting approximately 100 feet into the air, near the tops of the trees above the cliffs. According to Berger, people were attracted to Thunder Hole because of the combination of high surf from Hurricane Bill and high tide, which occurred around 1:30 p.m. She said that one estimate had as many as 10,000 people along the shore on either side of Thunder Hole. The center of the hurricane was about 230 miles west of Newfoundland on Sunday night, according to the National Hurricane Center. It had maximum sustained winds of 75 mph, and it was moving northeast at 35 mph. The storm is expected to continue to lose strength as it moves over cooler waters. Berger said that because Acadia has so many entry points from the communities that abut the park, it can be difficult to control access to the park. Closing the road to cars was relatively easy after the incident, she said, but before it occurred park officials felt that allowing cars along the road and allowing people to be on the rocks was safe until the large wave came in and crashed over the 20 or so people. Before the incident, the park had closed off access to Thunder Hole itself and had posted warnings at Sand Beach in order to keep people away from the water, she said. Berger said that the park also closed the loop road at Schoodic Point and where Route 102A passes by Seawall because of the heavy waves. On Sunday afternoon, the Coast Guard used a boat, a helicopter and a jet during the rescue effort and were assisted by Maine Marine Patrol and some private vessels, including a whale watch boat based in nearby Bar Harbor. Along the shore, park officials and members of Mount Desert Island Search and Rescue scanned the frothing water with binoculars to look for others who might have still been in the water. Ambulances from several towns on MDI also responded to the scene to help treat those who were injured or anyone else in need. A few hours after the incident, the scene was relatively quiet along Ocean Drive except for the crashing waves and the aircraft flying overhead. The park had closed the section of road past Thunder Hole to automotive traffic and were allowing only pedestrians to walk along the road. 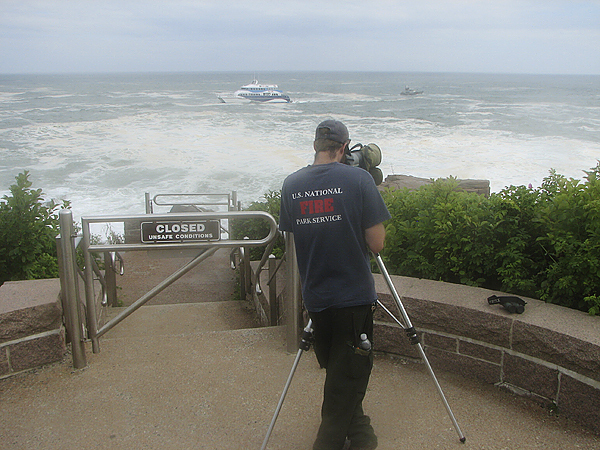 Despite the obvious ongoing search and the Coast Guard helicopter flying overhead, around 4 p.m. a man and a boy were seen down on the rocks near Thunder Hole, trying to get close to the crashing waves. People up by the road saw the pair and alerted park officials, who ordered the man and boy away from the water.